I just went to see an action packed summer blockbuster flick that’s been getting mixed reviews from fans and press alike. Now, I haven’t been to the movies since last fall, so I’m starved for that heart-pounding, head-rush of nonsense that Hollywood pushes on the masses but I liked the movie. I’m not going to reveal which one it is, that’s not the point. What is the point is how it made me feel. I got that adrenaline kick-in-the-pants my body craved and juiced my need for a vicarious romp in someone else’s shoes. I feel the same way about cathartic books. Sometimes these books fall into the general fiction or literary fiction category but for me, I tend to get a bigger emotional boost from genre-based fiction. Yes, that fiction most of the professional world looks down upon for not being as ‘sound,’ ‘having a posh literary writing style, or being as ‘intellectually stimulating’ as some pretentious works that the industry literati can’t stop raving about. The Creativity & Catharsis Award. 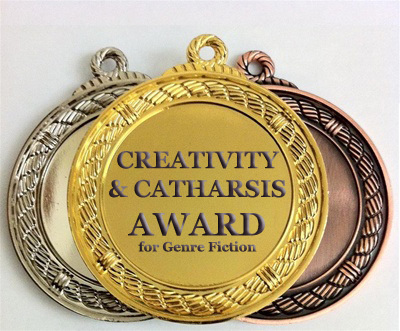 This award would consider all genre fiction (okay, maybe not all – erotica and similar stories already have their own awards) that’s both well-written and reader-emotive. But now comes the debate, right? What’s a “well written” novel these days? One free of grammar and spelling errors? That would be part of it. One that has an engaging and self-sustaining plot? One with characters a reader can identify with even if they’re slime covered aliens that smell bad? Most writers will agree that all of the above elements and more make up “well written” novels. But I think the strongest thing this award would state is that a true connection can be made between the reader and the characters to the point where the well-being of those characters becomes inseparable from their own conscience – that is where catharsis strikes, in the relate-ability between reader and protagonist/antagonist. I must say, I cried when Harry Potter’s owl, Hedgwig, died. My heart was torn from my body when Kate, of Plain Kate, lived through so much adversity only to have her talking cat killed. I laughed out loud reading Morgenstern’s commentary as narrator of The Princess Bride, and I threw the book across the room when Eragon’s love for the Elf Arya was unrequited. It is these physical reactions that affect who we are that are intrinsically attached to character, a well laid-out plot, and a sense of ourselves in a challenging environment. That being said, what book would you nominate for the Creativity & Catharsis Award?